An insulated glass unit (commonly referred to as an IGU or IG) is comprised of 2 or more lites of glass, separated with a desiccant filled spacer bar and is hermitically sealed around the edges to form a single unit. The hermetically sealed air space creates a barrier for heat and sound transfer making IGUs very effective in reducing air-to-air heat gain or loss. When combined with a low-e or reflective coating, the insulating performance of IGUs is significantly improved. Clear monolithic glass accounts for less than 5% of a window’s insulation value, the rest is being supplied by the still air layers of the environment on either side of the glass. Since the heat flow resistance of still air is much greater than that of glass, a glass unit made of two panes enclosing an air space will have about twice the insulation value of a single pane window (half the heat loss). A unit with three lites of glass and two sealed air spacers will have three times the insulating value. The additional airspace allows for better insulating properties, improving the unit’s u-vale. The third lite of glass also allows for a secondary low-e coating to be applied, thus further improving the energy performance of the unit. By combing tinted glass, reflective coatings and low-emissivity coatings the insulating value of the IGU can be significantly increased allowing a greater window-to-wall ratio while minimizing heat-loss and/or excessive heat-gain. Insulated glass units are made up of multiple lites of glass (minimum of 2). Each lite of glass consists of two surfaces. Each of these surfaces is numbered starting with outside glass surface (1) and finishing with the inside glass surface. Vitrum’s IGUs are dual seal units comprising of a primary seal of Polyisobutylene (PIB) to the spacer face and a secondary perimeter seal of Polysulphide or Silicone. This results in a high quality IGU that meets or exceeds all ASTM, CGSB and IGMAC standards. The exterior and interior lites of glass are separated using either an aluminum spacer bar (standard) or a warm edge spacer bar. To ensure the air within the sealed unit remains dry, the spacer bar is filled with a molecular sieve desiccant. Warm Edge Spacers have evolved as a result of research into IGU spacer systems which break the thermal bridge at the transition of the glass and frame edge. Traditional spacer options including aluminum and steel have the tendency to transfer heat from the exterior to the interior. 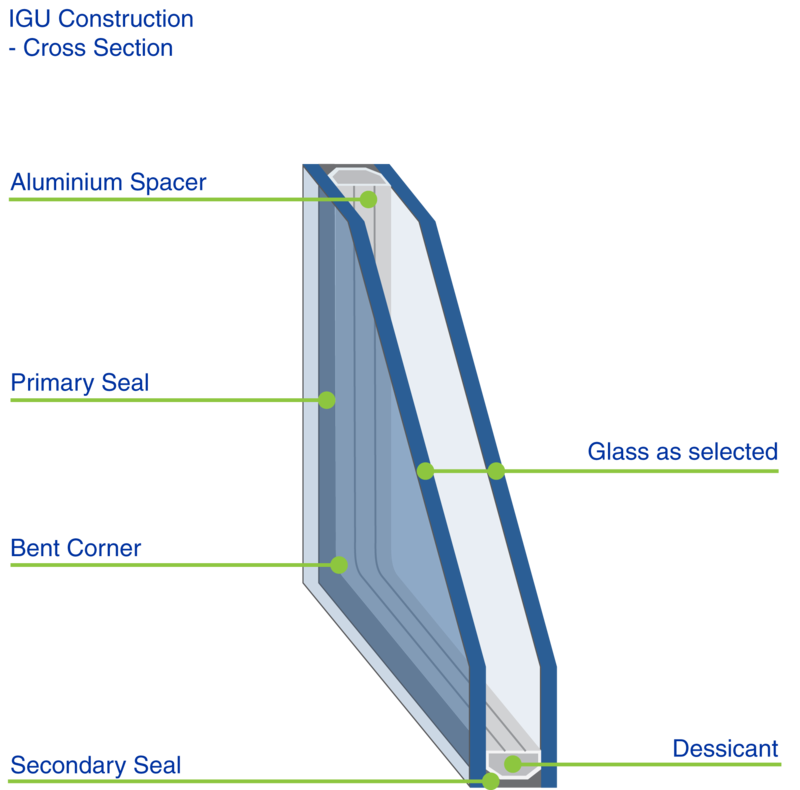 To reduce the amount of thermal bridging around the perimeter of the IGU Vitrum offers a warm edge spacer bar option that performs up to 35% better than traditional aluminum spacers. The warmer glass edge provides higher u-values and reduced condensation around the perimeter edge. Learn more here. Laminated insulating glass is an insulating unit using laminated glass as the inboard, outboard or both inboard and outboard lites. This style of unit combines the energy performance of an insulating unit with the safety features of laminated glass. It also offers greater acoustical thresholds, enhanced protection from ultraviolet light and an abundant array of design opportunities. As laminated glass provides an added safety measure against broken glass “fall out”, laminated insulating units are recommended for all overhead glazing (i.e. skylights, sloped glazing). Laminated IG units also provide protection against natural disasters, such as hurricanes, or man made threats, such as bomb blasts, or forced entry. A double laminated insulating unit (using laminated glass for both inboard and outboard glass lites) is often selected when improved OITC acoustic performance is required. The key factors for buildings in colder climates are reducing heat loss to keep the building warm and allowing some solar heat gain to warm the building. Specifiers should look for an insulated glass unit with a high u-value and moderate to high visible light. The performance of an IGU in reducing heat loss can be enhanced by using larger airspaces, Argon Gas and low-emissivity coated glass. Larger airspaces up to 16mm provide better insulation than the minimum 6 to 8mm and it is always advisable to achieve 12 mm or wider air spaces. Argon Gas can be used to fill the unit as it provides better insulation than air. The performance can be further enhanced with the use of Low-E glass as it traps the heat inside the building. The coating is normally used on surface 3 to reflect the building’s long wave radiation and is normally a clear or neutral colour with relatively high light transmission. 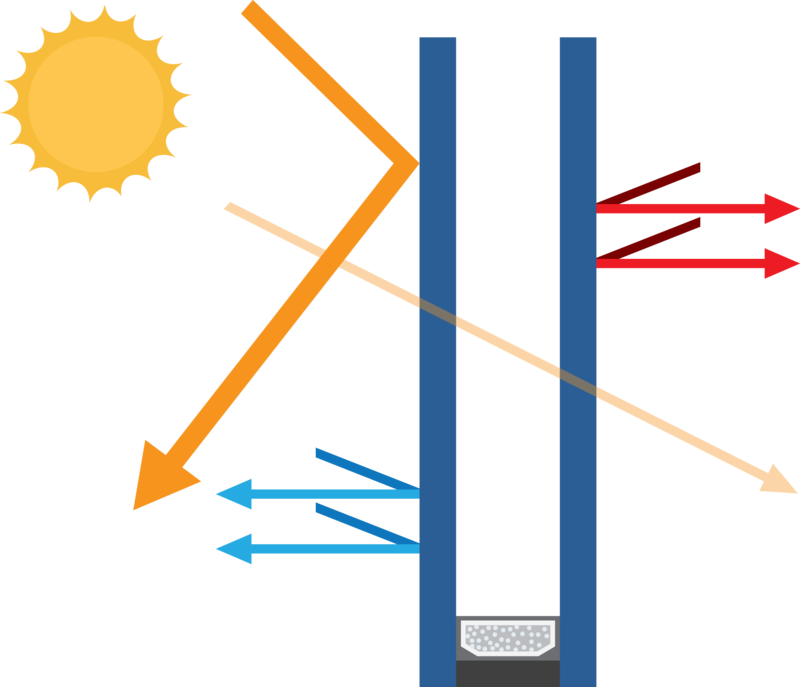 When solar gain is required to heat the building, the glass is usually clear as it allows the maximum solar gain. Low-E glasses will slightly reduce the light transmission and can slightly increase the reflectivity of the windows. Daylight and glare will be at their maximum with clear glass. Solar control glass and some Low-E glasses will reduce the light transmission and control glare. The key factors for buildings in hot climates are reducing heat gain from the sun to keep the building cool and reduce air conditioning loads. Specifiers should look for an insulated glass unit with a low SHGC (Solar Heat Gain Ratio) and moderate to low visible light. 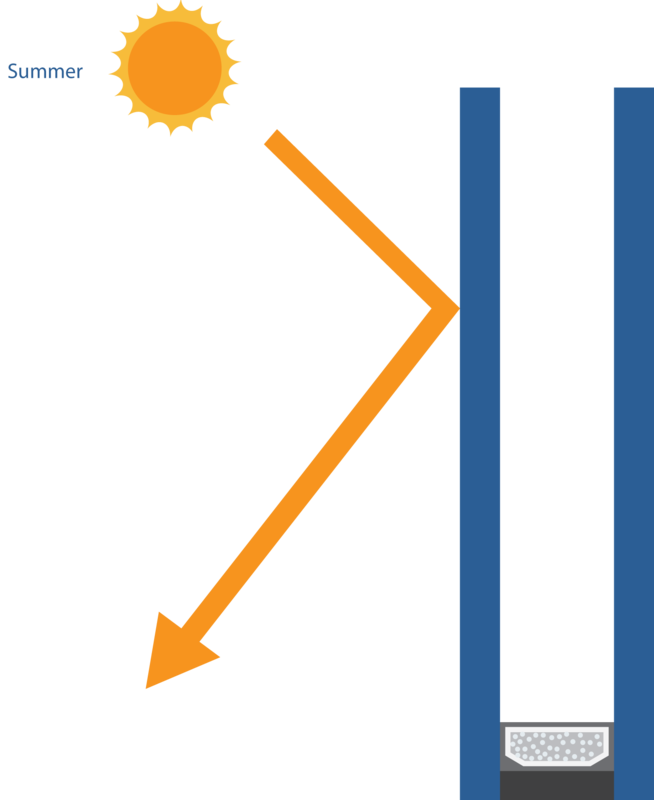 The performance of an IGU in reducing solar heat gain can be enhanced by using a solar control glass as the outer pane. The ability of tinted or reflective glass to control solar heat gain, combined with the added thermal performance of an IGU, maximises the reduction in solar heat gain. The IGU performance can be further enhanced with the inclusion of Low-E (low-emissivity) glass, as the coating reflects heat energy and improves the solar heat gain and thermal performance of the unit. 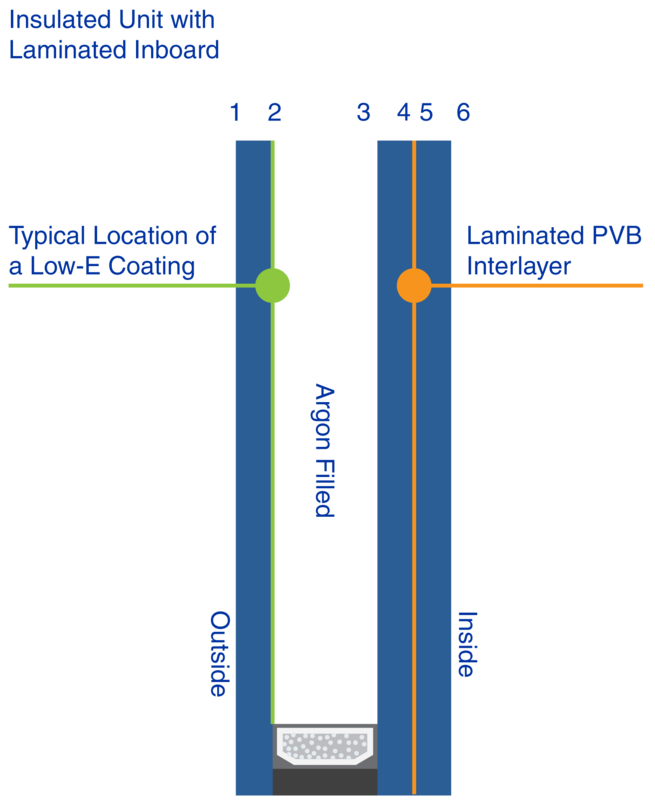 The Low-E coating is used on surface 2 or 3 of the unit depending on the glass combination and performance required. 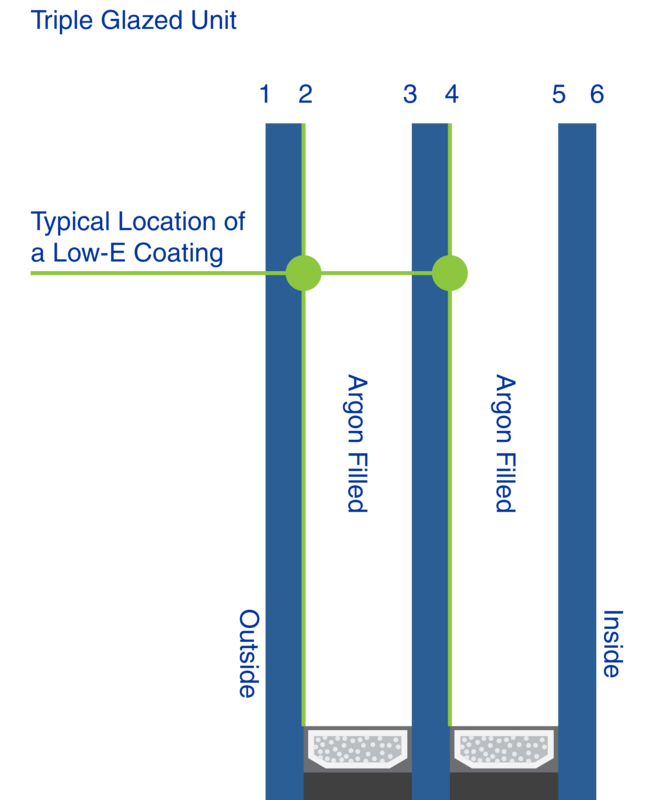 For hot climates it is advantageous to have the Low-E coating on surface 2, as the Low-E coating acts as a barrier, reducing the transmission of heat from the outer layer of glass to the inside. 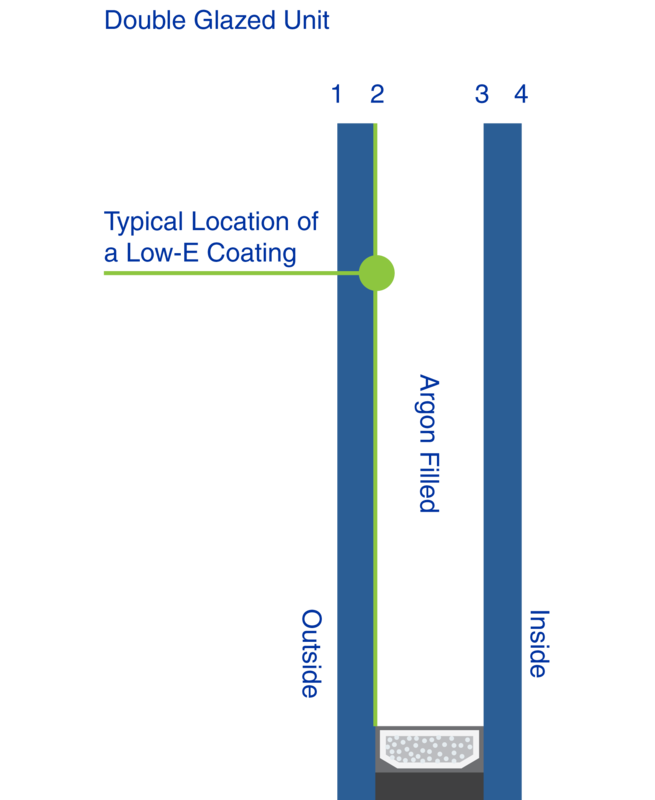 Sometimes the Low-E coating is used on surface 3 in combination with a standard solar control outer glass but this can be less effective in controlling heat gain. Thermal performance is also important in hot climates to stop the cold air from air conditioning systems escaping. This is best enhanced by larger airspaces, using Argon Gas and/or Low-E glass to improve insulation. Daylight and glare can be controlled by selecting glass types with a darker tint or reflective properties. Inner glass thickness and type. Insulated Glass Units can be constructed in a variety of shapes. Raking, circular and triangular units can be manufactured from drawings (i.e. CAD file), but other irregular shapes require templates indicating inside and outside positions of each glass with the unit combination clearly described. For coated glass the pattern must also be marked with the surface positions.